Of great interest are those works composed for Koussevitzky to play, but that he never performed. Not only is the Koussevitzky connection interesting, but they include music of a stature at least equal to that of other often-performed bass repertoire, and from a period during which little solo repertoire was composed. These are listed in chronological order. • Georgi Konius, Concerto (1910). The dedication to Koussevitzky is recorded in Musical Courier.59 Georgi Konius (1862-1933) was professor at the Moscow Conservatory and one of the outstanding Russian composers of his generation, whose students included Scriabin and Glière. His name is also transliterated as Conus: he was the brother of Julius Conus, the violinist whose Concerto (1898) was championed first by Kreisler, including performances conducted by Koussevitzky, and later by Heifetz. The relationship between Konius's bass concerto and the one attributed to Koussevitzky is intriguing, due to the formal similarities. Both are in F-sharp minor and begin with an introduction based on a tonic 6/4 chord. 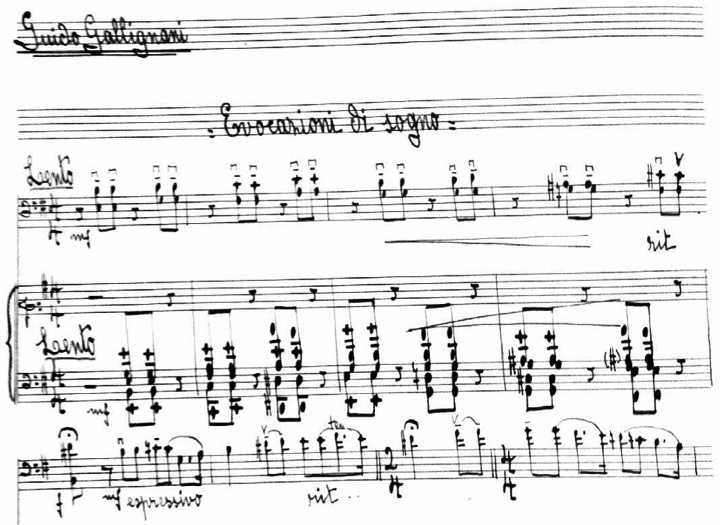 The large-scale form comprises three movements, with the second movement played attacca, and with much of the first movement recapitulated in the third movement. 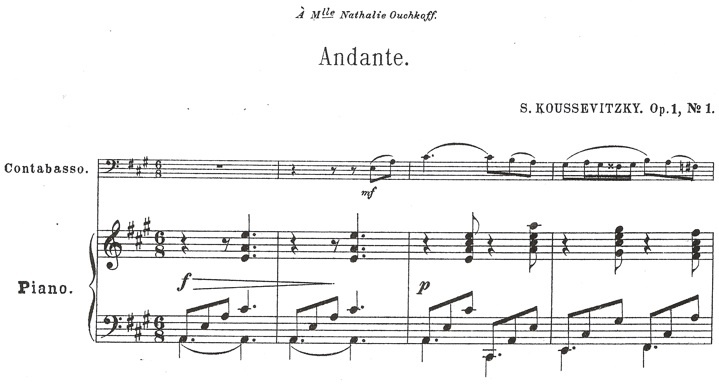 Given that the earlier concerto was ghost-written by Konius's student Glière, one wonders if Konius intended his work as an improvement upon, even an implied critique of, the earlier concerto. However, perhaps this structural scheme was used more broadly in Russia at the time. 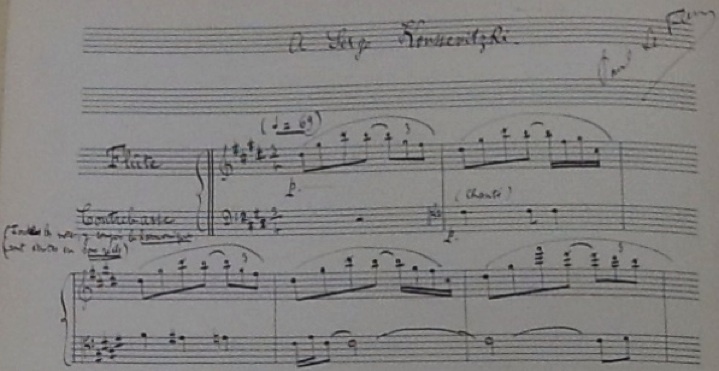 Although Konius and Koussevitzky moved in the same musical circles and had extensive contact, it seems more than a coincidence that Konius wrote the concerto rather directly after Koussevitzky conducted Konius's Scenes Enfantines for Orchestra, op. 1, with the Berlin Philharmonic on Mar. 6, 1908.60 What is certain is that Koussevitzky, who by 1910 was concentrating on his conducting career, never performed the Konius Concerto. It was only published, by Muzyka, in 1969. • Paul le Flem, "A Serge Koussevitzki" for flute and bass. On Sept. 2, 1924, Koussevitzky was given the remarkable honor of becoming a Chevalier de la Légion d'Honneur. The next day he sailed off to take up his new post as Music Director of the Boston Symphony. He next returned to Paris the following summer to conduct a series of concerts, as he continued to do each summer through 1929. It was not until June 18, 1925, therefore, that his French friends — performers, composers, critics — were able to fête him with an evening's entertainment, held in the party room of the daily arts journal, Comœdia. This piece, along with Roussel Duo listed below, was composed for that event.63 The manuscripts of both duos are now housed in the Library of Congress. The opening of the work by Paul le Flem is in Figure 16. Le Flem eventually transcribed the piece as "Pièce pour flute et violoncelle." The manuscript of this later version is held by the Médiathèque Musicale Mahler in Paris and excerpted in Phillippe Gonin's Vie et Œuvre de Paul Le Flem.64 A manuscript copy of the flute and cello version, prepared and provided by Michel Lemeu, has been helpful in preparing an edition of the original version. 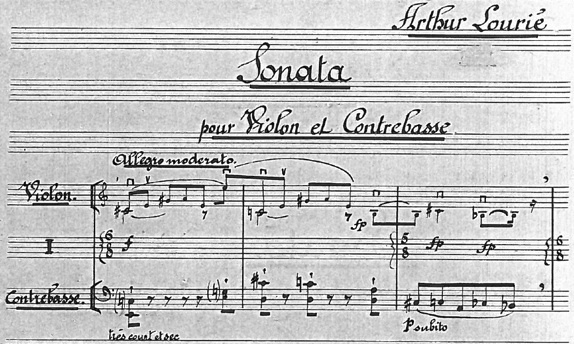 The other works presented on that occasion, not inclusive of the double bass, include several noteworthy composers, two of whose manuscript contributions are also in the Library of Congress: Paul Dukas's Allegro for piano, "Corillon-Fanfare," was performed by Alfred Cortot, and Alexis Roland-Manuel presented a Maestoso for harp quartet, a soggetto cavetto of "Serge" and "Natacha" (reduced to a solo harp performance that evening by Carlos Salzedo). Also in the Library of Congress is the manuscript of another piece that stems from that occasion: a brief, anonymous, and undated "Saluons le chef eminent" for solo voice, 2-part chorus, and piano. Interesting parallels link le Flem and Roland-Manuel. First, both studied with Roussel, which might have contributed to how they got tapped for this specific occasion. Moreover, both became more active as a critic than as a composer later in life, a trait they shared with Dukas. Note that the presentation copy calls for orchestrally tuned bass. 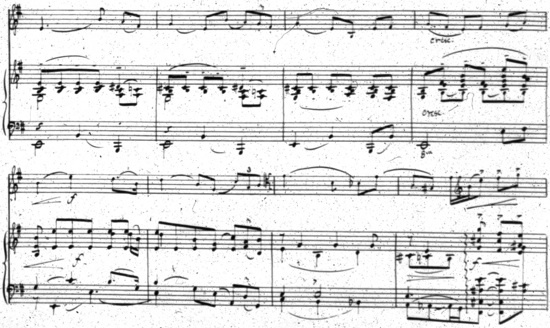 In the published edition (Durand, 1943) the piece is transposed up a step: this transposition mirrors what Koussevitzky did with a number of cello pieces, enabling him to use solo tuning, finger the piece in the original key, and leave it to the accompanying instrument to accommodate the change, as seen by comparing Figure 20 and Figure 21. 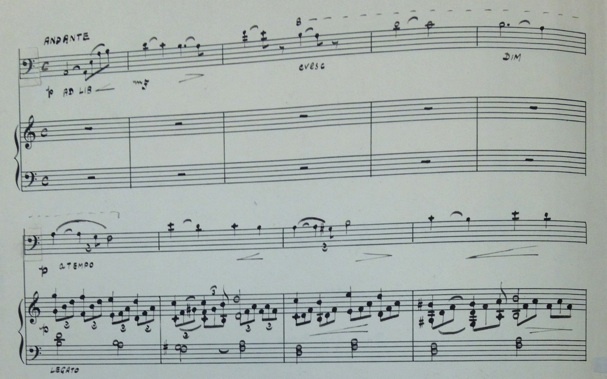 The published score also uses the very unusual — almost unique — strategy of notating the scordatura in sounding pitch rather than the usual transposition down a second (plus, in both cases, the usual octave transposition). 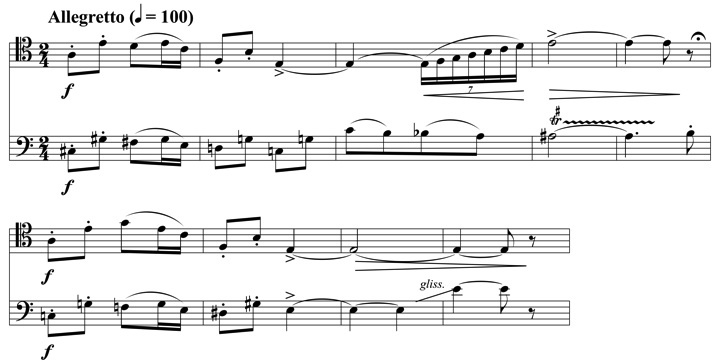 Since the original version of the bassoon part covers the range Bb2-C5, the published edition requires C3-D5, which, though not as extreme as the high E in the solo from Ravel's Piano Concerto in G Major (1929-31), does range as high as the opening solo from Le Sacre. For the fête in Paris in 1925, the piece was interpreted on harp by Carlos Salzedo.67 The Duo was formally premiered posthumously by bassoonist Fernand Oubradous and cellist Andre Navarra in 1937.68 Although the recent edition by Karsten Lauke, published by Saier & Hug (Berlin, 2008) and republished by Walhall (Magdeburg, 2016), includes material for both orchestrally-tuned and solo-tuned bass, the text is derived from the Durand edition, not the Library of Congress copy. Note, too, the similarities between the openings of the two Andantes (Figure 22 and Figure 23): both in A major, in triple meter, with similar introductions, and dedicated to their wives (each of whom are given French titles). Was Sevitzky drafting behind his uncle? Comparing? Competing? We can only speculate, but some reference to his elder relation is apparent. • Eugènie de Zanco, "Inspiration" for bass and piano. 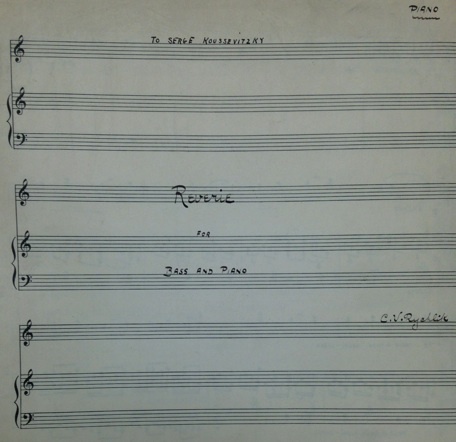 The unpublished manuscript in the Library of Congress bears the title page, "Inspiration/by Eugenie de Zanco/Conceived during the 'Koussevitzky Concert'/in Chicago, on Nov. 3d 1927." Since Koussevitzky conducted the BSO in Chicago on that evening of the 3rd, this could either mean that de Zanco composed the piece that very evening or, more likely, shortly afterward. Some biographical details about de Zanco can be gathered from scattered press mentions. According to Musical America, pianist Eugènie de Primo, reportedly a grandniece of Leo Tolstoy, was the wife of dramatic tenor Sergio [Servais] de Zanco.70 She was also known as the Comtesse Wandayne de Tolstoy.71 She lived in Petrograd, where she was pianist to the Russian Imperial court, and later in Paris, where she appeared as soloist with the Colonne orchestra.72 Her photo appears in an advertisement in The Music News, Dec. 8, 1922, p. 23.73 "Inspiration" comprises just 17 measures of pleasant but amateurish music, including double-stops that require an E-flat string and with rhythms that are not well-aligned between staves. • Charles Martin Loeffler, Norske Saga. 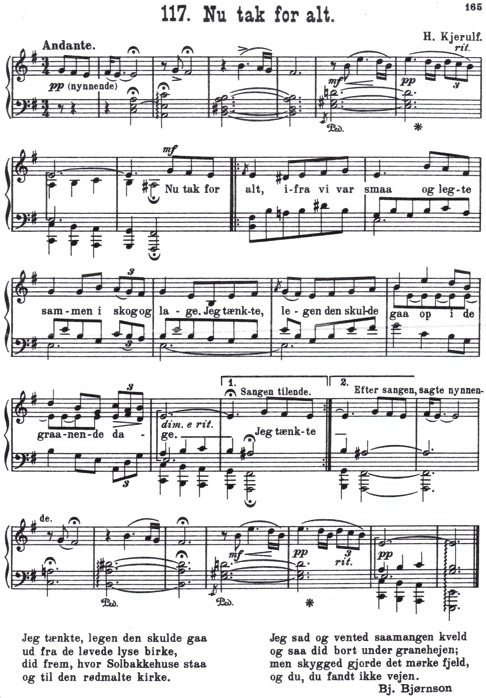 Full title: "Norske Saga/Divertissement/pour/Contrebasse et Piano/(D'après deux motifs norvégians et d'un Ranz da vaches, tirés da la Collection Nationale De Musique Norvégienne/publiée par Warmuth à Christiania.)/compose/pour/Ch. M. Loeffler" [Divertimento for Double-Bass and Piano after two Norwegian motives and one "ranz de vaches" taken from the Collection, "Norwegian National Music," published by Warmuth in Christiana]. Figure 25: Norges Melodier, Vol. 2, song 117, "Nu tak for alt"
The probable second source was a selected anthology drawn from Norwegian National Music and published locally in Boston by the Oliver Ditson Company, The Norway Music Album (1881).76 The borrowed melody from this source proves to be a Halling dance rather than a ranz de vaches; the change is perhaps reflective of Loeffler's well-known antipathy for all things Teutonic and preference for all things Gallic. This specific dance, taken from a collection by Ole Bull, is also included in the Oliver Ditson volume. The Halling dance is well worth describing. Figure 27: Loeffler, Halling-Dance from "Norske Saga"
• Yves Chardon, Basso Concerto: À Monsieur Serge Koussevitzky (1929). Cellist and composer Yves Chardon (1902-2000) was brought from Paris by Koussevitzky in 1928 to join the Boston Symphony.78 In 1943 he moved to the Minneapolis Symphony, where he played principal for Dimitri Mitropoulos and served as assistant conductor for seven seasons. When Mitropoulos assumed the music directorship of the New York Philharmonic in 1950, Chardon moved to Florida, where he founded the Orlando Symphony (now the Central Florida Symphony). In 1952 he moved to New York, where he served as alternate principal in the Met until 1976. He then retired to New Hampshire. 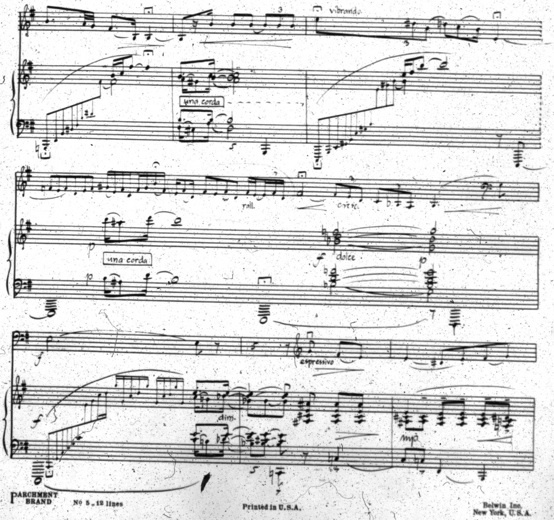 The instrumentation of this concerto, housed in BPL (Figure 28), shows an obvious debt to Stravinsky's Octet, also in three movements, premiered in Paris in 1923, conducted by Stravinsky in a concert organized by Koussevitzky. The style, however, is rooted in the pandiatonicism of Les Six. • C.V. Rychlik, "Reverie" for bass and piano. The manuscript is in the Library of Congress and bears the dedication, "To Serge Koussevitzky." Although the score has no date, the Library of Congress catalog lists this as being from 1940: well after Koussevitzky had ended his career as a performing bassist. Violinist and composer Charles Vaclav Rychlik (1875-1962), born in Cleveland of Czech ancestry, studied in Prague, where he also served as English language coach for Dvořák in preparation for Dvořák's move to the U.S. in 1892. After returning to the U.S. and playing in the Theodore Thomas Orchestra, Rychlik returned to Cleveland and played both in the forerunner of the Cleveland Orchestra and in the Cleveland Orchestra itself, 1901-20, as well as in the Philharmonic String Quartet, 1908-28. He made major contributions to violin pedagogy both as teacher and author. 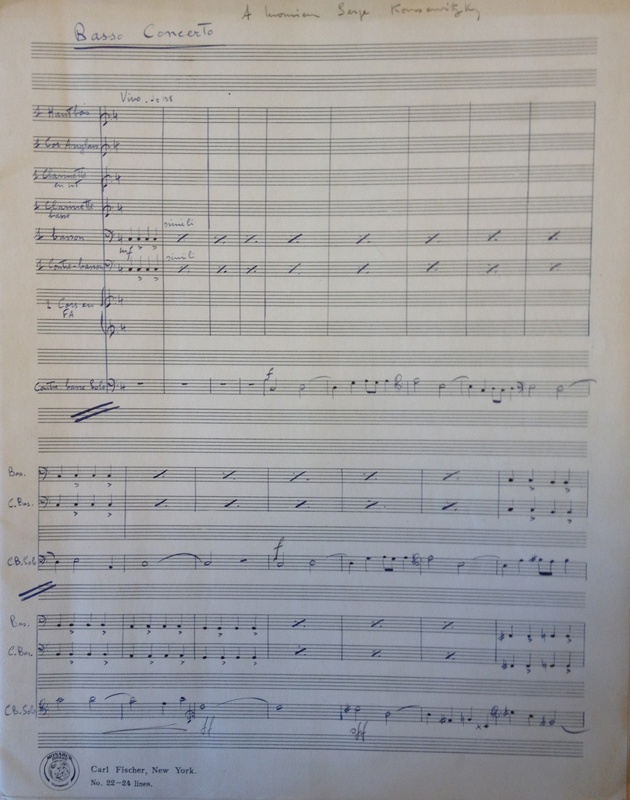 If the year is exact, the piece might have been composed consequent to Koussevitzky conducting the BSO at the Music Hall in Cleveland on Dec. 13, 1940.80 The manuscript is in the Library of Congress (Figure 30 and Figure 31). • Randall Thompson, Trio for Three String Basses. Thompson's most famous composition, the "Alleluia" (1940), was commissioned by Koussevitzky for Tanglewood. Thompson was tapped again for the Trio, composed in honor of Koussevitzky and premiered at the Harvard Club (of which Koussevitzky was a member) in 1949.81 The humor of this neo-Rococo work in four movements can only be fully appreciated in light of Thompson's description of the premiere: "It was solemnly programmed as 'Divertimento for Strings', to be performed by 'Members of the Boston Symphony Orchestra, Malcolm H. Holmes, '28, Guest Conductor'. "82 The distinguished audience must have been quite surprised to see Holmes confronting three bassists. The work is in the general style of a classical period divertimento in four movements.